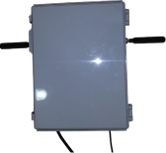 The Head-end (HE) is high-speed digital unit which is placed generally in an electric distribution box or in low-voltage/medium-voltage transformer, where it injects high-frequency backbone signal (brought by optical fibre, satellite, dsl or wi-fi) over the powerline. With the help of the Repeater (REP) the transmitted signal from the HE can be improved to reach longer distances. The Defidev MV/LV Head End can be easily integrated into an existing MV/LV network infrastructure to create a communication backbone for internet access, access control and automation applications. The AheS-260 is used to manage data and remote command securely via Internet or any WAN network. It acts as a head end for the flow of data (customer and management), organizes and transmits it according to its router configuration. By managing the flow data, the AheS-260 allows the QTNMS (DefiDev Management Software) to display meaningful reports, graphs, status and analysis for the entire powerline network. The AheS-260 can also receive commands from the QTNMS. These commands include changing operational settings. The AheS-260 can also work standalone to manage its local powerline network of which it is the master. The AheS-260 with its two integrated three-phase couplers and circuit breakers is easy to install within a network. It can work with a public routable IP address or on a private network with or without VLAN. The AheS-260 offers 5 RJ45 ports. In router mode, two ports are dedicated to the WAN access (ISP), two ports to LAN access and one port for the Administrator. It also provides a router to manage all data coming from PLC and Ethernets. The AheS-203 acts as a repeater for the flow of data (customer and management). The AheS-203 can also receive changing operational settings send by the QTNMS via the Head-End (AheS-264, AheS-260). The AheS-203 is a convenient way to create a simple outdoor network through the existing electrical wiring thanks to its IP66 casing.